This post lists and compares the best Central Park tours, including walking, bike as well as horse and carriage tours. We at Free Tours by Foot offer two main Central Park walking tours. We also offer an anytime, GPS-enabled audio tour. We recommend taking a look at our full calendar to see which tours are running when you will be in NYC. NOTE: If you find that you can’t make our scheduled tours, then please note that the New York Pass and the Explorer Pass include several Central Park tour options. Read our post on which tourist pass to buy. We offer several pay-what-you-like walking tours of Central Park, one of the lower section and one for the middle section. (We also offer bike tours). Our tours have no costs to book and are listed with (pay-what-you-wish) inside of the calendar and are also detailed below the calendar. We offer a seasonal and limited schedule of our Central Park walking tours, so we have also listed other for-fee walking tours available to you in the park. If you are interested in booking a private tour of Central Park, we have several affordable options available to you. Once described as the lungs of the city, Central Park brings a breath of fresh air to New York’s crowded urban terrain. What started out as the rocky and desolate northern fringes of a rapidly expanding city is today among the world’s most famous and beloved public parks. With over 843 acres of meadows, hills, ball fields and bodies of water, it’s impossible not to find something to enjoy in Central Park. Join Free Tours by Foot as we stroll through the park and tell the epic story of New York’s green oasis. This Central Park tour explores the southern half of the park, wandering the winding pedestrian paths, passing a pond, rocky outcrops, bridges, open fields and skyline views — all great photo opportunities. The tour also includes a stop in Strawberry Fields, a living tribute to John Lennon, and will end in front of the Dakota Hotel, where the great Beatles’ life was tragically ended. See photos of the Central Park tour on our Facebook page. Check out our self-guided Central Park Tour and map. Reservations: REQUIRED. Click here to reserve. Groups of 6 or more should visit our groups’ page. 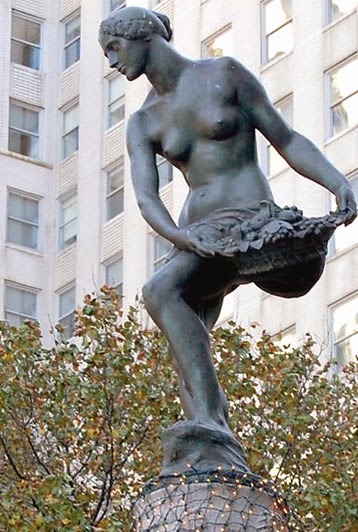 WHERE: Tour begins from the southwest corner of 59th St. and 5th Ave by the Pulitzer Fountain (Pomona – Roman goddess of purity) (map). The statue is located directly in front of the Plaza Hotel’s main entrance. Tour ends at 72nd St. and Central Park West. Duration: Approximately 2 hours. Approximately 1 mile in length. When: @2pm Wednesdays. View our full tour calendar. Take this any day as an audio tour. If you can’t make one of our tours, you might consider one of the New York tourist passes, which include free guided tours of Central Park or through Viator. It is easy to forget that you are in a crowded city while walking through this spectacular park! The original plan for the City of New York laid out by the City Commissioners in 1811 did not include the park. But as the city grew rapidly in size, we needed a place for New Yorkers to get a breath of fresh air! Central Park, with its 843 acres of meadows, lawns, ponds, lakes and more, was the solution. Today it is one of the best-known parks in the world and is enjoyed by millions-both locals and tourists alike. This tour focuses on the middle of Central Park, starting in front of the beautiful American Museum of Natural History. From there we will enter the park and explore, seeing everything from a castle to the wild-looking Ramble. See an Ancient Egyptian obelisk and the place where Stuart Little raced his sailboat in the E.B. White children’s classic. Don’t forget to bring along your camera! There will be many wonderful photo opportunities throughout. Check out our self-guided Central Park Tour and map. Reservations: REQUIRED. Click here to reserve. Groups of 6 or more should visit our group’s page. Where: Tour departs from the park entrance directly across the street from the American Museum of Natural History at the intersection of Central Park West, between 80th and 81st Streets (map). Tour ends at Bethesda Terrace, on the 72nd Street Traverse through Central Park. There are many companies offering walking tours of Central Park. However, many offer a limited schedule or only private tours. We have listed two additional highly rated companies that also offer regularly scheduled public tours, and we have ordered them by lowest price per person. Most of these tours are included at no additional cost on one or more of the tourist discount passes available to you in NYC. Click the link to read our comparison post on these passes. We have listed which pass(es) each tour is included on in the tour descriptions below. Central Park Sightseeing has an abundance of Central Park choices, whether by foot, bike, horse, or pedicab. Their walking tour explores the history and landscape of Central Park while addressing the many filming locations of popular Hollywood productions. Or explore more of Central Park by bike. Their bike tours are child-friendly, price includes the bike rental and helmet, with bikes rentals for all ages. If you want a more relaxing view of the park, you may want to consider their pedicab or horse and carriage options. They also offer our readers a 20% on all of their tours with promo code FTBF. See their full selection of Central Park tours here. Get 20% off the prices below with promo code FTBF. More information and book now. Their walking tour (as with all of their tours) are included for free with the New York Pass and the Explorer Pass discount cards. Central Park Sightseeing has a solid 4 out of 5 stars rating with almost 2,000 reviews. Even though the company website states tours cap at 25 people per group, a significant number of reviewers speak about much smaller groups sizes. Even if only one person purchases the tour, the company does not cancel for low attendance (which is a big plus!). Reviewers say the walking pace of the tour is enjoyable, not too fast and not too slow. Late afternoon attendees suggest taking the 9 am tour, before the day gets too hot or there are too many people in the park. Reviewers find the tour guides knowledgeable, entertaining and accommodating. If English is your second language, you will want to inform Central Park Sightseeing so you can be matched with the best tour guide suited for you. On Location Tours has a more narrowly focused itinerary. Although you will get Central Park history, this tour is for the Hollywood buff (and who has never watched a movie or a television show?). The tours are led by actors and actresses, which adds to its authenticity. Thousands of television shows and movies have been filmed in Central Park, so with a 2 hour themed tour, you will get your money’s worth. Some of the many filming locations covered are Home Alone 2, When Harry Met Sally, Taxi, Elf, Breakfast at Tiffany’s, Serendipity, Crocodile Dundee, The Producers, just to name a few. On Location Tours offers a full range of movie and television tours of NYC. Daily @ 12 pm (March-December) Check for availability and additional tours. TV and Movie Tour Package: If you purchase their 3.5 hour New York and Movie Sites tour, you can add Central Park TV and Movie Sites for only an additional $12. Tours are taken on separate days. Learn more about their combo option here. On Location Tours has a strong 4 out of 5 stars rating on TripAdvisor with over 2,000 reviews. Reviewers find their tour guides very informative and enthusiastic, and the fact that they are actors themselves is seen as an advantage. Reviewers feel that even if you are not a movie buff but you are traveling with one, there is enough trivia that everyone in your group will recognize some pop culture, along with enough history about the park itself to make it enjoyable for all.